Geraldo Rivera is an American attorney, journalist, writer, reporter, and former talk show host. Rivera is hosting the newsmagazine program Geraldo at Large and he is seen regularly on Fox News Channel. Often associated with tabloid television, Rivera was actually a lawyer before becoming a controversial TV personality. He earned a law degree from Brooklyn Law School in 1969. The next year Rivera joined the news team of New York's WABC-TV. His hard-hitting report on the abuse of mentally retarded patients at the Willowbrook School earned accolades and high ratings. He started contributing to national ABC news programs, such as Good Morning, America, and joined the staff of 20/20, the primetime news magazine, in 1978. Rivera's career took a different turn in the late 1980s. After being fired from ABC over a disagreement about a report, he started Geraldo, a daytime talk show, in 1987. The show was criticized for its controversial, sometimes tasteless topics and for the not infrequent scuffles between guests. Rivera himself got caught in the crossfire during one show and got his nose broken. The show ended in 1998. Rivera joined Fox News Channel in 2001. While covering the war in Iraq, he again drew criticism in 2003 for reporting troop positions and military plans and was forced to leave that country. 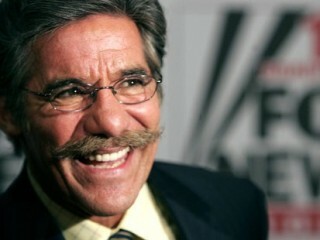 Rivera returned to hosting his own show in 2005 with the syndicated news program, Geraldo at Large. Over the years, Rivera has been willing to make of his reputation as an aggressive, theatrical journalist and host. He appeared several television shows and films mocking his public persona, including the 1994 Oliver Stone movie Natural Born Killers. Despite the common perception of him as sensationalistic, Rivera is a distinguished journalist, having received numerous awards, including seven Emmy Awards and the Peabody Award, for his work. View the full website biography of Geraldo Rivera.